The box scores for these early spring training games can be longer than the story of the game itself. That’s because this is a chance for the coaching staff to get to know some of the “other” players in camp – the guys who have almost zero chance of seeing Opening Day in The Show. They’re the names that you squeezed in at the edge of your scorecard. The guys that confuse the announcers, with uniform numbers that approach triple digits. To most of us, they’re afterthoughts. For now, that is. Because two years from now, the scribbles on your scorecard have a chance to be that key September call-up, or the crucial July injury replacement. (Heck, some will find themselves thrust into a rebuilding bullpen THIS year.) That’s the thing about following the Twins – these guys have a chance to matter. That’s one reason why the Maple Street Press Twins Annual consistently has a section on the Twins farm system, including a minor league system overview. This year, Seth Stohs compiled the top five prospects in each of five areas: starting pitchers, relievers, catchers, infielders and outfielders. I'm going to rip him off, and take a look at the top prospects in four of those areas, so you’re primed for those later innings of these spring games. #1 – Kyle Gibson – Gibson is not only the top starting pitching prospect, he’s arguably the top prospect in the system AND the most likely to significantly impact the Twins major league club this year. He’s only been in the organization for one full year after being the Twins #1 draft pick in 2009. But he shot up through three minor league levels last year, ending up in AAA-Rochester. He fits the Twins starting pitching mold: he doesn’t have dominant stuff, but has very good control and induces a lot of ground balls. If members of the rotation struggle, he could take that last step and play a significant role after the All-Star break, ala Danny Valencia last year. #1 – Carlos Gutierrez – In the Twins minors, he’s been a starter, but he could end up a dominant reliever. He’s got a 97 mph fastball that sinks, along with a slider and improving changeup. He spent most of the year in AA-New Britain, but the Twins haven’t been afraid to reach down that low for relievers in the past, as Jose Mijares and Alex Burnett attest. With the Twins bullpen in flux this year, don’t be surprised if he finds his way up to help out this year’s team. #1 – Miguel Sano – Unlike the other guys mentioned, he definitely WON’T play a roll this year, seeing as he’s just 17 years old. Sano was a highly sought after international signee that chose the Twins in 2009, and showed what he can do in 2010 when he hit .307/.379/.491 at lower levels. That likely means you won’t see him in spring training this year, but you’ll want to remember that name a few years from now. #1 – Aaron Hicks – Another possibility as the top prospect overall in the Twins system is Hicks, but he also won’t be making his acquaintance with The Show this year. He was a #1 pick by the Twins in 2008 and has speed, power, plate discipline and a great glove. The center fielder did well in low A-ball last year despite a tough start and will likely make it to High A ball this year. He’s one of two players (Ben Revere is the other) that Denard Span has identified as the next in line Twins centerfielder. So check out some of the indented names on the box scores this spring. Yankees fans can ignore them, content to wait for hundreds of millions to be thrown at the gap in their roster. But Twins fans get to grow with their team. See what these guys have picked up while toiling for six years in minor league obscurity. And decide for yourself which ones might be your next favorite big league player. You can pick up the Maple Street Press Twins Annual 2011 at newsstands in MN or order it early (or if you're out of town) at TCAnnual.com. And if you REALLy want to O.D. 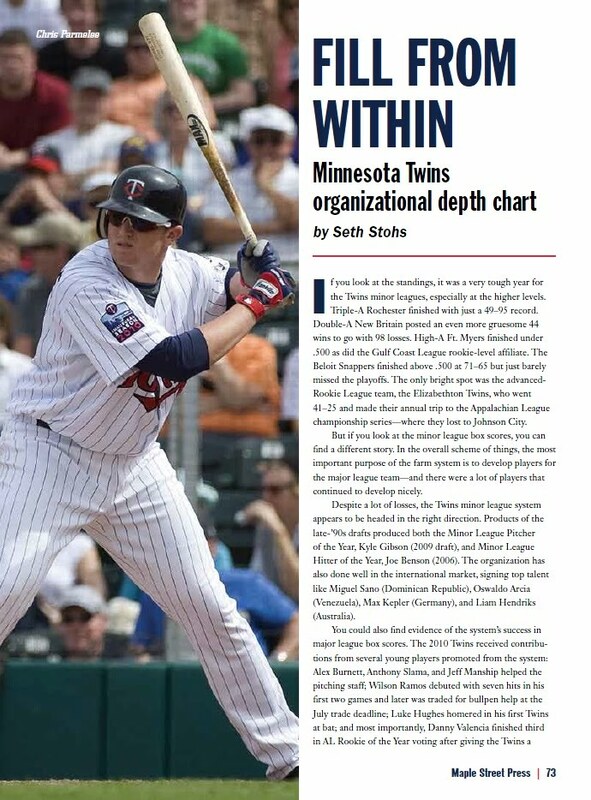 on the Twins minor leagues, check out Seth's Minnesota Twins Prospect Handbook for 2011. I find it hard to believe that Carlos G has a consistent 97MPH fastball that sinks. Even as a starter with that type of pitch his numbers wouldn't be so medicore. I's day he averages 90-92 MPH with sink as he does induce ground outs. Billy Bullock is a much harder thrower with a better minor league track record so far. That 97 mph figure may be high, but my understanding is Gutierrez throws in mid-90's. The problem is that he lacks any other pitches which is why he will end up in the bullpen. Bullock gets a lot of strikeouts and walks a lot of batters as well. Unfortunately, hitters turn the pitches they hit into hits. His high k/9 is almost as much a function of not being able to get outs any other way as it is his strikeouts. Uh Billy Bullock struck out 105 batters in 73 innings pitched last year. That's amazing. It translated into being very effective in 2009 & 2010 in the minors. At the more advanced level he has 14.73 K per 9 ration. Carlos has had no success at all in the minors. Not as a reliver or a starter. "Uh Billy Bullock struck out 105 batters in 73 innings pitched last year. " Yes, it is. But it is partially amazing because it indicates how FEW batters he got out without striking them out. Aferall, "innings pitched" is just another way of saying per out made. When hitters make contact, they appear to hit the ball pretty well. His strikeouts per batter faced are still pretty good, but not nearly as "amazing".